I was very excited to be offered the chance to review a few children's books. I am not a homeschooling mama and that seems to me who gets most of the kids books to review. This book is a set in poetry form- very simple for younger readers. Each page has a one line of the poem, so this is probably not a book for older children. What makes this book stand out is the illustrations. They are very detailed and beautiful. 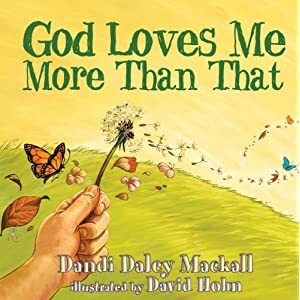 The focus of each page is a young boy who is imagining and dreaming how big, how wide, how tall, how deep, how loud, and how soft God loves him. This book is very sweet and would make a great gift for a young family member. I am going to enjoy reading this book to my son over and over. I reviewed this book for Waterbrook Multanomah. The opinions in this review are mine alone. Getting this book for free does not guarantee a good review.